My Outside Voice: The Call Came In. . . The Call Came In. . . This time from DC. Can't ignore it this time. We were watching The Office when the call came in. Had a very nice dinner, a nice big salad and chicken fajitas. The boy did the dishes while I flipped my laundry. The boy does dishes people. I don't have a dishwasher, I have the boy. We are still unsure of what is going to happen, he is still on medical hold due to high blood pressure, but he has been given medication. Will that be enough? Do I need it to be? Will his blood pressure be back to normal already? The Command Officer said that they are pulling 10 for May and 10 for June. There are not even 10 left in Minneapolis to pull so they will be a combination of the Chicago and Mpls. units. I am very torn. I am proud of him. I believe in him. I believe in what he is fighting for. 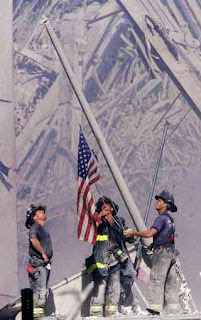 I was there in NYC for 9/11, I felt the ground shake, I felt the panic, I lost friends. It is a civil war they are helping to fight. They are helping to protect us. But, I am ready for it to be over. I want peace. I want our fathers, uncles, grandfathers, grandmothers, aunts, mothers, sisters, wives, brothers, husbands, cousins, boyfriends, girlfriends, neighbors and friends to come home. Safe and sound. We still have to wait and see what is going to happen, but I am scared. I said good-bye today to one of the guys from his unit that he was supposed to leave with today. He leaves on Sunday, this is when the boy was due to leave. I told him thank you. I am so torn, I want him here with me, I don't want to be lonely, but I want him to help to protect all of you too. He truly is wonderful and just wants to do what he has signed up to do. It is hard to be so torn. If we can coordinate our schedules this summer, we will get together and have a cheer for our men who are doing incredibly brave and honorable things! Nicely put, very thoughtful insite on the whole situation. We are thinking about you and the boy. Oh and, I need to come to dinner you always eat well!